The author, D.X. Dunn, provided me with a copy of the novel in exchange for my review. Alex and I read this novel separately and when she finished she raved about how great the story was. “Do you know when the next one is out, Mom?” she asked. She is a dragon girl, so I expected Kali to be everywhere in the story line. Not so. Kali never appears in this installment of the Distania Chronicles. In her place is a little girl named Agata, cousin of Arthur who only for a moment twice in the novel, but has made a big impression on young Alex (the reader) as did the wonderfully delicious sense of danger arising from the boys newest adventure. As with An Unexpected Twist (The Distania Chronicles), Alex and Chris are realistic pre-teen boys. The story is also reasonably short though complete. In the first novel, the boys see Erik’s kingdom in the distance and in “An Unexpected Twist” they find themselves within Erik’s dome. Alex did comment that the shining bubble in which the magicians transport themselves is “very Oz”. There is a Baum inspired quality to the books but not a true comparison. The boys are transported through links on the computer and then an app on the phone. The history of the land and location, given to us by a character in “An Unexpected Twist” does not mimic the World of Oz at all. The spirit of mystery and magic reflects both works and I have to think anyone who grew up loving the Oz series, as I did, would love Distania as well. Alex disagrees with me that the lesson of An Unexpected Twist (The Distania Chronicles) is that 11-year-olds should not have cell phones. She believes the lesson is to think critically. The children at a perfect age for this novel are at a stage where they badly need the lesson that everyone sees life from their own perspective. What one child may find grossly unfair, another may find just. Alex and Chris model for children critical thinking in their approach to Erik and his Kingdom. The author, D.X. 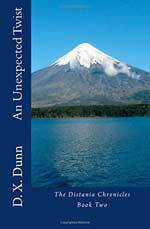 Dunn, leaves us hanging with promises of unicorns and mermaids. Myths are reality is Distania. I have an inside track that the next novel in the series heavily features a unicorn. Are unicorns silly creatures as Erik tells the boys? Stay tuned to Distania to see. The Distania Chronicles are beautifully set and wonderfully written. A perfect read for children grades 2 to 5 of both genders. If you have young children or generally like novels for young readers that are well written, pick up An Unexpected Twist (The Distania Chronicles). For further reading check out my reviews of the two other books in The Distania Chronicles: An Unexpected Adventure (The Distania Chronicles) and An Unexpected Invitation.